Before we launch into How to treat Plantar Warts, lets run through what plantar warts are, why you get them and how to get rid of them with the least trauma. The term ‘plantar’ just refers to the bottom of your foot. A wart on the sole of the foot is a plantar wart. A wart on your hand would be a palmar wart, on your face, a facial wart etc. It is not a special variety of wart, but it is a particularly nasty place to have one. The term ‘wart’ refers to the nature of the lesion. Warts are caused by a viral infection of the skin cells of the upper layer of the skin called the epidermis. The virus causes the cells to mutate and become abnormal. Each time the skin cells divide, you get two abnormal cells, then four, then eight, etc. The virus is called the Human Papilloma Virus. Warts might also be known as Papillomas or Verrucas. Keep reading to learn How to treat Plantar Warts in the next section. How do you get Plantar Warts ? It is useful to know how to get a wart to avoid future infections, before learning how to treat plantar warts. We have seen that Plantar Warts are a viral infection skin. They are reasonably contagious. To become infected with a wart on your foot, it means that you have stepped on a viral wart particle that has dropped off another wart on a human and stayed alive long enough to be picked up by you. Swimming pools and public showers often get the blame for transmitting warts. This is probably reasonably accurate because the viral wart particles live a lot longer when dropped into a damp area. Also, your skin is much more receptive to being infected when it is nicely plumped up and waterlogged. This creates more gaps between the skin cells for the virus to invade. We would probably all like to think that we must have caught this unpleasant thing from some ‘dirty stranger’. Now that you have a wart of your own, consider, who is most likely to put their foot where yours has been, immediately after you, on a wet surface? The number one person most at risk from getting a wart from you, is you! In our podiatry practice, we rarely see people with a single wart. Often there is the bigger, oldest “mother” wart and several other smaller ones of varying ages and sizes. The next most at risk from your warty hitchhiker is your family or others who share the wet areas of your home. So, getting a grip on How to treat Plantar Warts is likely to reduce the number of warts on yourself and your family. Why do Plantar Warts hurt so much? If you have a wart or a mole on your forearm, it will sit out of the skin. On the weight bearing areas of the foot though, the lump is pressed into the skin to sit flush. In normal skin, the nerves that report pain and other sensations back to your brain are laid out in such a way that they are protected. In a wart, the arrangement of cells in the surface of the skin is disorderly. This results in the nerve strands being ‘stepped on’ which can be very painful. Warts are tricky things to treat, mostly because they are composed of a mutation of your own skin cells. Therefore, anything that we do to your wart, we do to you. The blood vessels that pass into a wart are your blood vessels and the nerves that supply it are your nerves. Unfortunately, the end result of this is that there is no completely painless way to treat the problem. It is definitely in your best interest to treat the wart as soon as you notice it. Warts will grow bigger over time and delaying the treatment will usually mean a bigger wart, even more warts spreading across your foot and a more painful job. To be rid of a wart, it must absolutely all be killed. The particle that initially infected you would have been a tiny viral particle, 1,000,000 times smaller than a drop of water. If anything even this size is left behind, the wart will regrow. When it comes to how to treat plantar warts, burning or cutting them out is only really advisable if it is not on the part of the foot that touches the ground. If it is on a weight bearing surface, these methods shouldn’t be used as a first resort as they will leave a scar that will probably cause painful corns in later life. Walk Without Pain Podiatry Clinics – How do you Treat Plantar Warts? In our clinic, we commonly use chemical cautery as it is one of the most friendly of approaches for removal. This term means using a chemical – either an acid or the opposite of an acid- called a base to kill the wart tissue. Depending on the size of the area, the wart may be shrunk first with a three day application of a slow acting chemical. Two benefit of this approach are: that it generally does not cause any pain at all and it can greatly reduce the size of the wart left to treat. The downside is that this method will not usually get the job completely done. When the size of the growth is more manageable, the wart is then killed. For this we use a quick acting chemical which takes just a couple of minutes to work. This is done under local anaesthetic injection. This approach is likely to be the least painful in the long run. The chemical forms an immediate scab over the area, protecting the new wound and at the same time cauterising the nerve endings. ‘Sharp’ methods of removal involve removing a margin of good flesh around the wart, just to be sure. Our chemical agent shows a preference for wart tissue and a reluctance to burn the dermis of the skin – where the wart does not infect. This means we can take a very precise amount of tissue and leave the normal skin cells intact. This reduces the chances of scarring, because scarring arises from disruption of the lower level of the skin cells called the dermis. Freezing of the growth is another option. While good for warts on softer skin, on the plantar surface / sole, it will usually require multiple applications. This can be as painful than chemical cautery, both at the time of application and over the following days. On the upside, it does not require an injection and may be more suitable for children or for killing off a wart that is still quite small. In addition to How to Treat Plantar Warts, How can I prevent them? While actioning the information about How to treat Plantar Warts, three things are important. Keep the wart covered before treatment commences and while it is occurring to avoid further infecting yourself or others. Clean all wet surfaces that your bare foot has touched in the last few days using bleach and water. Don’t apply bleach to your skin. After treatment, inspect your feet and those of anyone else in the household for several months. This is because you may already have a tiny wart growing elsewhere on your feet that is currently too small to see. Wearing non slip footwear into wet public places, such as gym showers is a good idea to avoid any future troubles. Be kind to your fellow bathers and don’t let your uncovered wart be the one that infects them. What are the black spots I can see in my Plantar Wart? 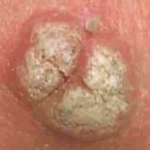 Warts have a typical, cauliflower appearance as shown in the diagram. The nerve tissue becoming disorganised inside a wart, so do the blood vessels. The black spots you can see are blood vessels that are poking out of the skin, an orientation that doesn’t occur normally. Yes, plantar warts are contagious. They will usually become covered with a callus. It is a good idea not to cut, pick or buff the callus off as this barrier makes a wart significantly less contagious. Is it necessary to know How to Treat Plantar Warts? I like to tell people, “Your body is really good at killing warts. It is just really bad at knowing they are there”. It is probably true that your warts will go away by themselves eventually. On the other hand, this might take years. In this time, if you go from one wart to 200, it probably won’t end well. All told, I think it is better to jump in and treat the warts quickly and effectively. This will reduce the treatment required, incur less pain and expense and reduce scarring. Some home-remedies involve ‘annoying’ the wart tissue. This is an attempt to get your body to realise that there is a problem to attend to. There may be some value in these. However, they can also expose the wart tissue that is shedding viral cells. This makes it more likely to spread to other parts of your feet or other family members.